Michael’s latest contribution to high-end content aggregation is a collection of sources and links on the Traxler/Wilkes Barre counter attack, some of which he gets from Dennis Monokroussos. Yes, I know: serves me right for playing the Fried Liver Attack against a master. Notice that every move White (moi) made beginning with 7. Ke2 was not only wrong but probably the worst one possible in each position. Anyone can blunder, even Kramnik, but to do so repeatedly and spectacularly takes a special gift, you must admit. Thanks, Professor Goeller. I will attend to the lesson promptly. A current and former Ray School chess star were reunited last Sunday in Northbrook, Ill., after a two-year separation, and the magic was still there from the days they both competed for dear old Ray. Ray fifth-grader-to-be Phillip Parker-Turner, a leader on the local scholastic chess circuit, found himself in the same tournament with his old teammate Marco Codenotti, who, in the two years he’s been back in his native Italy, has made a name for himself in chess tournaments all over the Continent and even Dubai. Marco is spending the summer in Chicago. Both kids added to their formidable reputations on Sunday by finishing second in their respective divisions in the Knights Quest Tournament sponsored by the Renaissance Knights Foundation. Marco got a trophy as the runner up in the Open division, while Phillip did the same in the U1200 group. The game itself may be somewhat beside the point here, but if you have nothing to do, why not record the moves, analyze the last position shown, and tell us which side is ahead at the end of the video. Why didn't White play 2. Nxe5? Click twice on the screen to watch. Billy Colias was a brilliant, young chess master from Munster, Indiana, who was stricken with cancer and died tragically in his twenties. That was 1993, but the passage of time hasn’t dimmed his memory here in the Midwest, where he’s honored each year with The Billy Colias Memorial Master Invitational Tournament. It’s become quite a tradition: “the best event” on the Illinois chess calendar, according to NM Jon Burgess. This year’s tournament took place last weekend at IM Angelo Young’s Touch Move Chess Center. The mostly-masters event brought together a dozen of the region’s top chess players: FM (FIDE Master) Pete Bereolos, NM (National Master) Jon Burgess, Expert Geoffrey Caveney, FM Albert Chow, FM James Dean, NM Pete Karagianis, NM Tim McEntee, Expert Gopal Menon, Expert Adam Strunk, NM Steve Tennant, NM Ken Wallach, and NM Len Weber. A number of these guys knew Billy, some of them well. I understand, for example, that Pete Bereolos was a Munster schoolmate of Billy’s and came up with him in the ranks of chess. That could help explain why Pete played so well, posting four victories in the five-game round-robin meet (a record matched by Jim Dean). The big news of the weekend, though, was Adam Strunk, a junior player from the South Suburbs, the third player to post the tournament’s top score of 4.0/5.0. He beat NMs Burgess and Tennant and drew against FM Bereolos and NM Karagianis. I don’t know much about Adam, except that he is a Warren Chess Scholar, which means he was in high school this past school year. Andi Rosen, who directs the Warren program, says Adam only started playing serious chess a few years ago. He’s certainly making up for lost time. Adam started the tournament with a rating of 2078, but that will certainly go up. “His performance rating from this event was 2456,” said Tournament Director Glenn Panner. The crosstable’s here, thanks to Glenn’s prompt reporting. For helping to make the weekend a success, Glenn made a point of thanking IM Angelo Young for hosting the tournament and Robert Loncarevic and Tim McEntee, who along with Glenn himself sponsored the meet. Sevan Muradian of the North American Chess Association provided some gorgeous chess sets. Though he moved to New York and climbed onto the national stage in his last years—managing the famous Manhattan Chess Club, collaborating on chess books with prolific chess author FM Eric Schiller—Colias appears never to have forgotten his Midwestern roots. One of the last rated tournaments in which he played, in fact, was right here on the South Side, at Tom Fineberg’s Tuley Park Chess Club. He came in first. Here’s a game in which Colias beat the famous Grand Master Roman Dzindzichashvili. 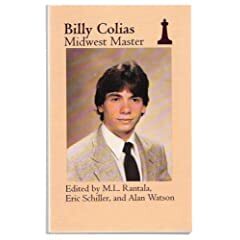 If you want more, pick up the tribute book Billy Colias: Midwest Master. It’s got about a hundred of his best games. Miscellanea: Congratulations to Lamarr Wilson for lasting eleven days in his juice fast. Here’s his wrap-up on the ordeal. . . . Vince Hart not only got a victory in a recent simul against a Russian Candidate Master; he also got some valuable publicity for chess in the Mt. Prospect Times. . . . Does chess teach kids lessons of value beyond the game itself? According to Dr. Alexey Root, former U.S. Women’s Champion, it does (hat tip: Brad). . . . Sad news from Westchester County, N.Y., where a local paper reports that veteran chess player Jerome Kurtzberg was killed in a car accident last Friday. The Journal News said that Mr. Kurtzberg became a chess master in 1981. Even at 76 he was an active tournament player and maintained an expert rating. Our condolences to his friends and family. Sightings of Elvis have doubtless been on the rise this week, it being the thirtieth anniversary of his putative death, but The King isn’t the only one being spotted in unexpected places. Marco Codenotti, the former Ray School chess star who returned to his native Italy two years ago, has been seen in Chicago, where he is spending the summer. He is of course active in chess, training with local GM Dmitry Gurevich and playing in the odd tournament, most recently the August 12 Third Coast Challenge by Renaissance Knights in Northbrook. Marco, you may recall, made headlines in the chess world a few months ago when he beat an International Master in a tournament on the island of Elba. Since then he’s been quite the globetrotter. 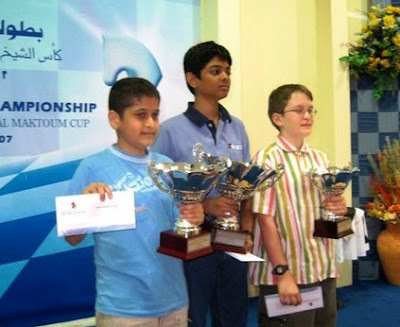 His father reports that he played in a major international youth tournament in Dubai, finishing first in the U10 division and second in the tournament overall. He finished right behind FM (FIDE Master) Srinath Narayanan of India and ahead of another FM, Ulvi Bajarani of Azerbajian, who came in third. Meanwhile, the Italian blogger Mida, himself a FIDE Master, spotted Marco playing in a major tournament in Bergamo. Marco’s World Chess Federation rating is now 1969. Not bad for a ten-year-old. Speaking of last Sunday’s Third Coast tournament, congratulations to Chicago FM Aleksandar Stamnov for winning it, which he did against stiff competition, including the remarkable Brian Luo of Wisconsin, who’s about Marco’s age and rated over 2000 USCF; and Indiana IM Emory Tate, about whom we have discoursed before. You’ve seen Searching for Bobby Fischer, right? I’ll bet you thought those guys played pretty fast, didn’t you? But wait’ll you watch Grand Master and former U.S. chess champion Hikaru Nakamura against International Master Ben Finegold in a game of speed chess. Fasten your seatbelt, click twice on the screen to watch the video, and don’t blink—you’ll miss three moves. Belated congratulations to our neighbor The Ancona School, its chess trainer Wayne Smith, and manager Charles Swan for a splendid write-up about the school’s chess team in the June 20 issue of the Hyde Park Herald. The article was prompted by the school’s conspicuous success at two major spring chess tournaments, the Chicago Open and the National Elementary School Championships. Ancona students named in the article for their outstanding play were Nosa Cash O’Bannon, Clarence Bourne, Jonathan Jackson Jr., Noah Jackson, Charles “CJ” Swan Jr., Coleman Strong, Anthony Chen, and Kamal Bilal. I’m pretty sure I’ve seen Kamal’s name high on the crosstables of Youth Chess Foundation of Chicago tournaments, so he’s one to watch. Mr. Swan Sr. also thanked Ancona math professor Zeus Preckwinkle for help with the team. 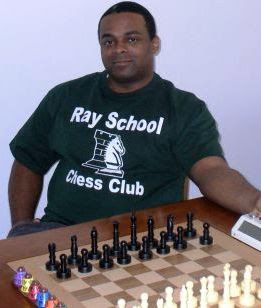 For some time I’ve known that Wayne, a top local chess trainer and majordomo of The Hyde Park Academy of Scholastic Chess, was working with Ancona and that the school had a rapidly improving chess program, but I didn’t realize just how good they had become until I read the Herald story. Wayne is also training kids at U of C Lab School, and their growing club, combined with Ancona’s and Ray’s, is making Hyde Park a flashpoint for scholastic chess in the Chicago area. Congratulations, everyone. Lest anyone think the Boylston Chess Club has a monopoly on funny chess photos, here's one from us. We do, however, gratefully acknowledge BCC as the source of our inspiration. Leave your caption as a comment below. If nobody enters, I keep the prize. 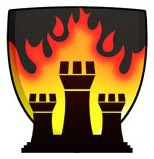 Former U.S. chess champion GM Boris Gulko has won the 2007 U.S. Open Chess Tournament on statistical tiebreaks after seven players tied for the lead with 7.5/9.0 at the end of the nine-round tournament. The other players who tied for first were Alexander Shabalov, Sergey Kudrin, Benjamin Finegold, Michael Rohde, Michael Mulyar and Anton Del Mundo. Though participation by Chicago and Illinois players was light, Tony Cao, the Land of Lincoln’s top high school player, finished 40th in a field of over 400. Other Illinois players who made the pilgrimage to the Philadelphia suburb of Cherry Hill, N.J., for the meet included Eric Rosen, James Egerton, Lawrence Cohen, Tenzing Shaw, and Andrew Chen. Illinois Rising: Kudos to several chess people in our fair state who have recently achieved national milestones and recognition. Sevan Muradian took Organizer of the Year honors from the U.S. Chess Federation, while Donna and Fred Gruenberg got USCF Distinguished Service awards. Meanwhile, chess promoter Betsy Dynako, one the best photographers in the game, has added the title of Associate National Tournament Director to her resume. Congratulations all around! The expression “liquid diet” is generally a euphemism for hitting the sauce. One reason people recognize it as a term of art for excessive alcohol consumption is that few people ever go on a real liquid diet. But Lamarr Wilson is doing it. The educational technologist, former chess coach, webmaster emeritus, and friend of Ray School says he won't take solid food for the next 30 days. Only juices. Losing weight is one reason, he says, but it goes well beyond that. Inveterate blogger that he is, Lamarr will chronicle the whole thing on his weblog. Look for his reports at http://www.lamarrwilson.com/blog/. Good luck, Lamarr. I hope you’re successful and that the fast makes you feel better. I’m interested to hear how it affects your chess game. In a U.S. Open tournament that is light on high-profile participants from Chicago and Illinois, the Prairie State has nevertheless made itself felt in the person of Tony Cao, who finished second in the Denker competition for the top high school chess player in the United States. Tony, who hails from downstate, finished with a splendid 5.0/6.0—that’s five victories in six rounds—against the other 49 state champions. The only player to finish ahead of him was the winner, Warren Harper of Texas, with 5.5/6.0. Tony’s only loss came in the fourth round to Warren. Maxx Coleman of Kansas also finished with the same record as Tony but ended up in third place on tiebreaks. The Denker tournament is named for the late, great International Master Arnold Denker and is taking place in conjunction with the 2007 U.S. Open and the Susan Polgar Invitational for Girls. Julia Kerr of New York won the Polgar tournament—Illinois had no representative, I believe—and the main event, the U.S. Open, continues. After six rounds, Tony is in 42nd place in a field of 416 players, while Eric Rosen of Skokie in is 56th place, with 4.5/6.0. Eric, an eighth-grader-to-be and a strong Class A player (1900+) got a draw in the third round against strong master Daniel Shapiro of New York. While Eric has beaten masters before, Shapiro (2300+) is the strongest player against whom he has gotten at least a draw. Incidentally, considering the problems that tournament officials have had getting results from the tournament up on the Web, I and others around here are indebted to Eric’s mother Andi Rosen, who has sent home regular dispatches from the scene. In other action, IM Amon Simutowe, not a player I’d ever heard of before, staged an upset in beating former U.S. Champion Grand Master Hikaru Nakamura in round 6. I’ve heard of him now! Simutowe is in second place behind leader Benjamin Feingold of Michigan. More as it becomes available. Update: This just in. Eric Rosen got a draw in his final round against Maxx Coleman, who finished third in the Denker competition. Eric, it's worth noting, isn't eligible for the Denker competition, since he's not in high school yet, but as the Cubs say, wait'll next year (though, of course, it has a completely different meaning in Eric's case). DEATH (disguised as a priest confessor): How can you outwit Death? ANTONIUS: By a combination of bishop and knight, I will break his flank. I guess the moral of the story is never tell anyone your strategy. This being its 50th anniversary, a revival of interest in Ingmar Bergman's 1957 classic film The Seventh Seal was under way well before the filmmaker's death at 89 last Monday. It's the story of a knight returned from the Crusades and suffering a crisis of faith. Facing Death himself, he contrives to hold off the Grim Reaper by challenging him to a game of chess. His aim, it seems, is to buy time to satisfy his curiosity about God's existence and perform an act that will give his life meaning. But I'm no film critic; see it and judge for yourself. Click twice on the screen to watch he trailer. 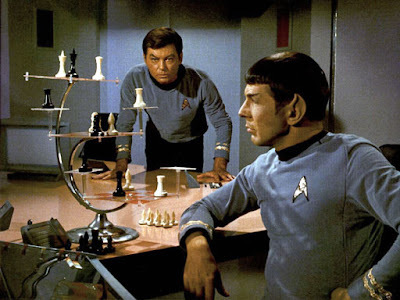 Chess in a Parallel Universe? I’m not really sure what this is all about, but the picture was too much to pass up. Far out (I think).